Get ready as our remarkable Heatwave Collection is here to have you on trend for the Spring/Summer Season. This collection is made to have you shed on the over layers, flaunt that hidden figure and have those feet tread in style. Make sure to take a Chic Sneak Peek Today! April 16 2015 – Today, .PENUMBRA. FASHION WEEK Spring Summer (S/S15) announced the lineup of designers and shows for their Spring Summer 2015 fashion week, May 16 – May 23. This year, we reached out to a group of new and inspiring designers, along with our known fashion designers. And also, new this season will be mid-week trunk shows which will be smaller shows in a more intimate atmosphere. This season promises to offer something for everyone. The closing show on Saturday, May 23rd is being sponsored by ETERNALLY YOURS Weddings and Events and will be showing bridal themed designs. In total, there will be 16 shows, representing 47 designers and showcasing over 200 designs, including womens and mens apparel, makeup, and jewelry. The full date and time schedule will be announced at a later date, along with entertainment, on-site boutiques offering items from the various shows and locations for all the festivities. There exists a space of shadow and light, the almost imperceptible zone between luminous sun and the velvety black of an eclipse. This is the merging place of light and dark, the niche of perfect illumination and shadow. This is the penumbra. PENUMBRA is the premier fashion event showcasing the newest collection by top and innovative, cutting edge, and emerging Second Life’s designers. .PENUMBRA. offers high-quality fashion events and marketing for both the consumer and the fashion industry. I feel like a work of art in GizzA’s new Absinthe Dress and Leggings for the Black Fashion Fair. Since you cannot see below me, smiling, yes I am on a pedestal!!!! Laughing, my man friend (he’s too old to be called a “boyfriend”) says I belong on one! Absinthe is available both as a dress with leggings and as a dress. Absinthe’s inner dress lining can be color changed either to a vibrant color or pastel hue with a touch of the Texture Changer. Absinthe is a striking strapless, asymmetric hem, modified A-line silhouette dress, with beautiful lines. The leather of the skinny pant is so supple looking, that you want to reach out and run your hand along it’s butter soft richness! 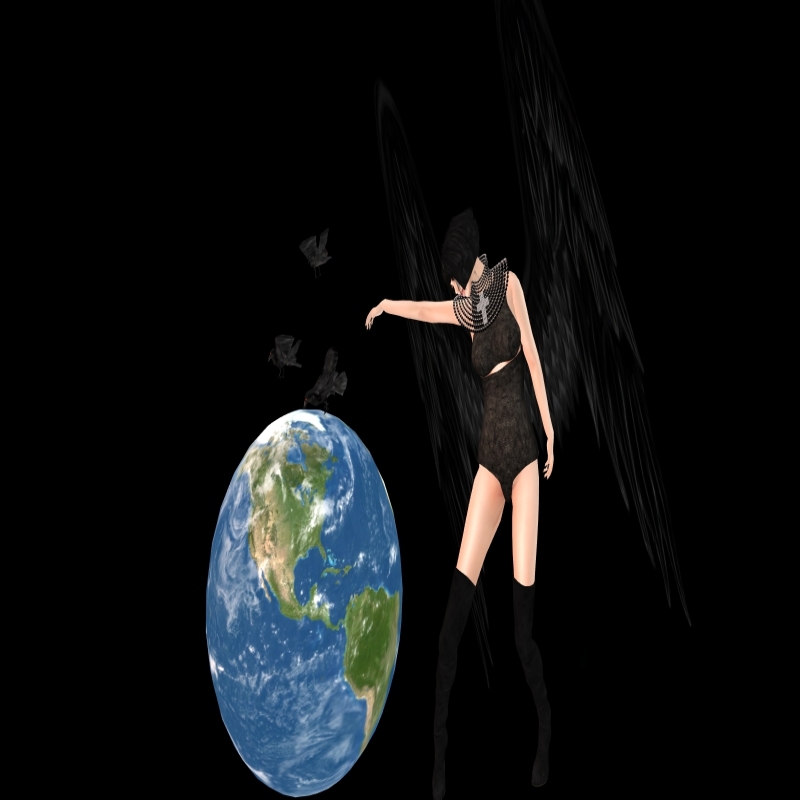 The Absinthe Black is made exclusively for the Black Fashion Fair that starts April 17th and will open at 1 pm slt. It will close at 4 pm slt, on May 1st. Be a work of art wearing Absinthe in Black! I am very proud to be walking the catwalk this weekend as a new Ferosh Model! How awesome is that!! !